Rory MacDonald and Tyron Woodley were confirmed for UFC 174‘s co-main event yesterday, and today the show’s featured attraction was announced. 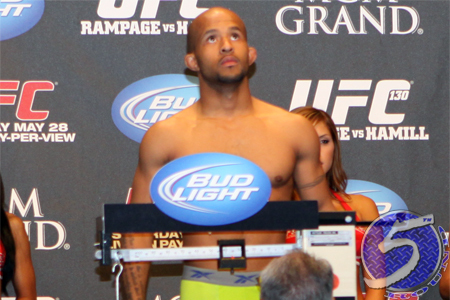 Reigning flyweight champion Demetrious Johnson (pictured) will defend his throne against Ali Bagautinov in the June 14 card. SportsNet first reported the news Wednesday, which the UFC subsequently confirmed. Johnson hasn’t dropped a scrap since losing to former bantamweight champion Dominick Cruz in October 2011. He’ll be riding a five-fight winning streak into his showdown with Bagautinov, with his last three bouts being of the 125-pound title defense variety. Bagautinov has rattled off 11 consecutive victories, with his past three coming inside the Octagon. February’s unanimous decision win over John Lineker was good enough to earn him next dibs at the crown. Rogers Arena in Vancouver, Canada serves as host.